Ferit Yücel Ergün was graduated from Baskent University Law Faculty in 2002. He has Baskent University Law Faculty Criminal Law and Criminal Procedure Law Seminar Participation Certificate and TOMER English for Law Translation Certificate. 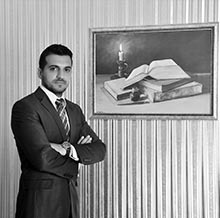 He is especially interested in Civil Law, Property Law, Zoning Law, Obligations Law, Commercial Law and becoming an expert in these areas.